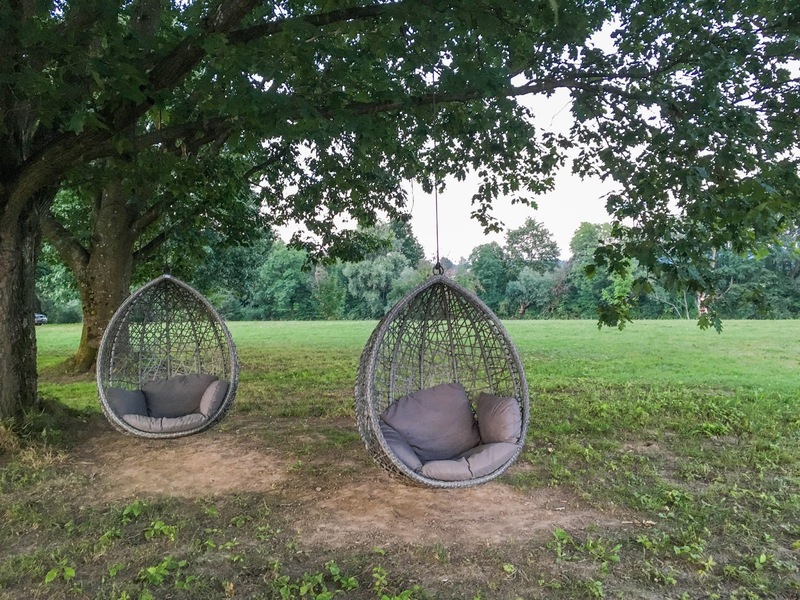 |TRAVEL| :: VISIT SLOVENIA AND ENJOY A FULL GLAMPING EXPERIENCE AT BIG BERRY :: | . m i k s t e j p .
I was invited on a Press trip to discover Bela krajina, a region that I have never been before, even though it's only a good hour away from Ljubljana. We stayed at Big Berry Luxury Lifestyle camp that has a concept of »a luxurious camping« or maybe you've heard about »glamping« before. It's like camping, but far more luxurious. You're not staying in a tent, but you'll enjoy a stay in a beautiful mobile house that was made by Hosekra and can be for two, four or six persons. If you want to see the layout and get more info about the rooms please check here. When we arrived, Ana (event planner at Big Berry) was there for us to show us around and explain all the important things. She brought us beer from Vizir (a local partner) to cool down from a hot drive we had and that was a big gesture for us (thanks Ana!). ;) We were actually really lucky with the weekend we picked because the weather was at its best. You know, it's always much nicer to enjoy the sun, then hide from the rain. 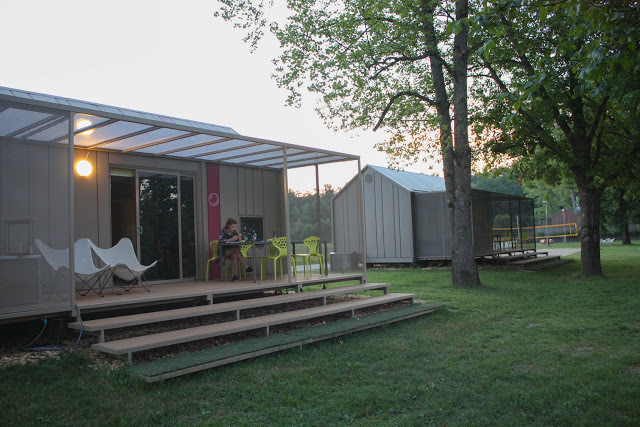 Each mobile house has it's own patio with a hot tub, which honestly, is great for drinking wine at the sunset. ;) Breakfast is on your patio every morning at 8am and it comes in a cute basket full of local products from partners in the region. Be brave and wake up early to join the fitness, which is usually from 8-9am. Janko (the trainer) has some serious moves, so prepare to sweat a lot. When finished, jump in the river Kolpa for a refreshment, have a shower (or not) and enjoy your breakfast fully, because you've earned it. Trust me, it feels so good. I wish I could do this routine every morning, but usually I'm always rushing to work. All of the above is just a very short description of how your mornings might look. If you do the same I guaranty you, that your day will be great, because you'll feel energised throughout the day. Ok, let's get serious now. Enough slacking, it's time to be a lil bit active so we'll sleep tight in the evening. What do you think about canoeing, sounds good, right? 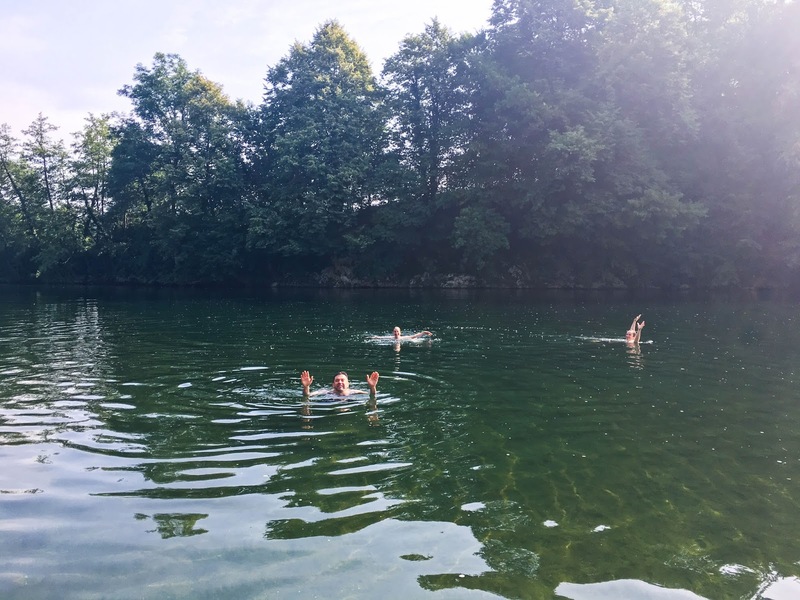 Well, they are there waiting for you to jump in and go on an adventure on Kolpa. Maybe cross the river and say "Hi" to Croatia or just enjoy and explore. Bring a small backpack with snacks and a drink perhaps. Who said picnic on a canoe can`t be done? ;) Haha, and talking about slacking before... I wasn`t talking about slackline, but you probably know that and just so you know, it`s there between the trees waiting for the brave ones to show some skills. If you're not much into water sports there's a beach volley court in the camp as well. 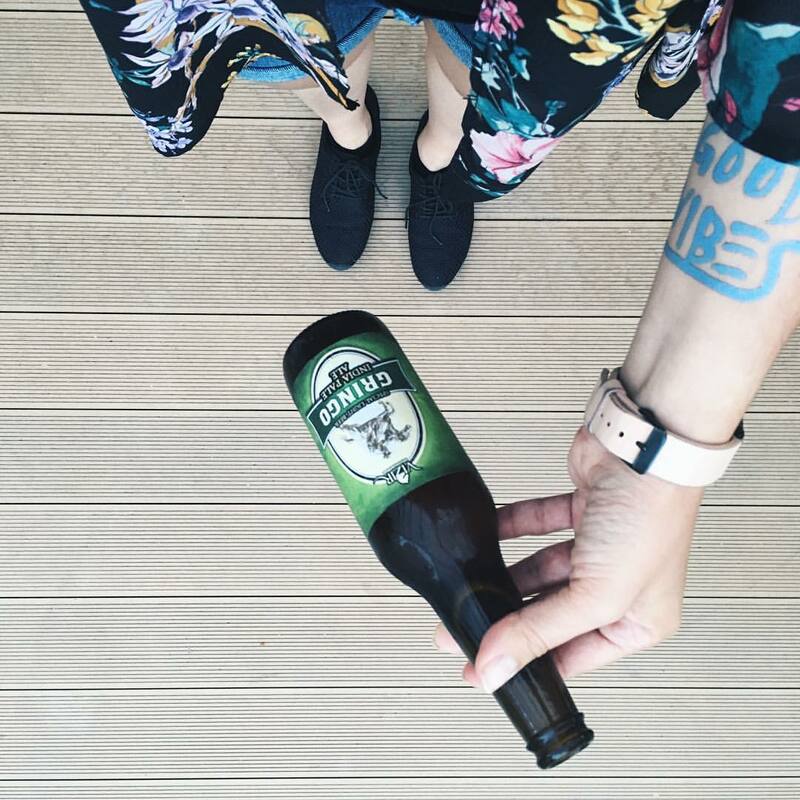 Make a competition to see who will pay for that beer in the evening. That can always turn up as a lot of fun..
..or if you're one of those people that has to constantly move, simply just go for a walk through fields around the camp. The landscape is scenic, I`m sure you'll love it. Oh, also you can rent bikes in the camp and explore a bit faster. ;) We'll talk more about this in the next post where I'll be introducing partners and Bela krajina. Our day is slowly coming to an end and we feel it's time to enjoy the sunset at this lovely lounge place. Don't forget to bring a bottle of wine from Malnarič winery or some chilled champagne. If you feel like it, sleep outside. Feel the nature. *don't forget on your repelent though. I wanted to guide you through the activities of a day in a camp, but there's much more to it. Check here for all the activities available in the camp. I love the fact that WIFI is everywhere and admit it, we all need it, no matter how much we want to escape from it. One other amazing thing are herbs and berries around the camp that you can pick whenever. You're cooking a dinner? Making a lemonade? Need herbs? No biggy, they're right there , almost next to your doorstep. ** Find more info about Big Berry here. ** Prices start at 200 EUR per night, which is not the cheapest accomodation, but I honestly think it's well worth it, considering the package you're getting. ** Animal friendly : Dogs allowed, yey! ** Near to a supermarket if you want to buy food/drinks. ** Great location for making day trips. In the next post I'll introduce Bela krajina and the partners Big Berry is working with. If you liked this post I'd be happy if you'd click on a like button, leave a comment and if you're in a really good mood perhaps even share it. ;) Obrigada!